Hello, everyone. Welcome to episode 183 of Against the Odds. Last week, we had an all-Kamigawa Against the Odds poll, and the results were unsurprising in the end: One with Nothing—a card considered to be among the most useless in the entire history of Magic—took home a crushing victory. 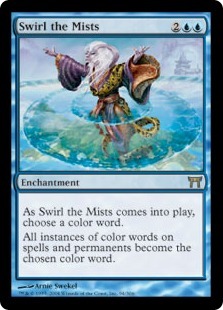 As such, we're heading to Modern this week to play a deck looking to discard its hand to One with Nothing. Then, at the end of today's article, we'll be running an all-Kamigawa poll minus One with Nothing to give the other poor Kamigawa cards a chance at glory. As for the deck itself, the main plan is to use One with Nothing as a way to stock our graveyard with threats and also cast a bunch of madness burn spells on the cheap, which in turn will allow us to get our threats back from the graveyard and (hopefully) kill our opponent as early as Turn 3. 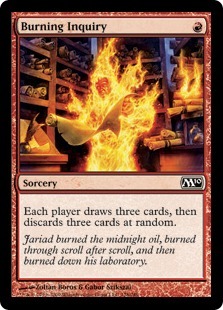 If all else fails, we can discard our hand and use Infernal Tutor as a Modern-legal Demonic Tutor to find whatever we need for a given situation. Is it possible to win a game by discarding our entire hand to One with Nothing in Modern? Is there any chance the one-mana instant is better than people think? Let's get to the video and find out; then, we'll talk more about the deck! When One with Nothing won the poll, my initial idea was to take advantage of some of the "whenever you discard a card" creatures from Amonkhet like Shadowstorm Vizier. 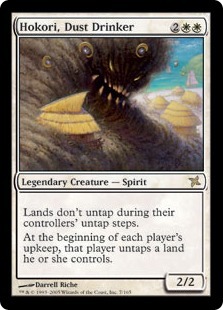 However, after playing several games with the deck, I realized that One with Nothing simply didn't do enough in the build, often making us discard our hand for the equivalent of casting a Giant Growth on Shadowstorm Vizier. As such, it was back to the drawing board, where I eventually ended up with the build we're playing today: a sort of weird, madness-y Arclight Phoenix–, Bloodghast-, and Prized Amalgam–fueled deck. While not all that consistent, the deck can be quite explosive when everything comes together, potentially winning the game as early as Turn 3 with the help of One with Nothing! The upsides of One with Nothing are that it's cheap at one mana and instant speed. The downside is that the effect of One with Nothing—discarding your hand—is actually something you'd rather not have in 99.9% of decks, which makes it a challenging card to build around. For One with Nothing to work, we need a weird combination of cards that actively want to be in our graveyard and cards that are better when we discard them from our hand. Even then, One with Nothing can be pretty painful in some situations since it's an all-or-nothing proposition—we can't just discard the part of our hand that we want in the graveyard or to madness; we have to discard the entire thing. Thankfully, with some careful deck building, there are some ways to (sort of) harness the power of One with Nothing. First and foremost, we have three creatures that actively want to be in our graveyard since they can return to the battlefield for free. While they all work slightly differently, in the end, they are similar: after we discard them to One with Nothing, they will (hopefully) reanimate themselves to kill our opponent. 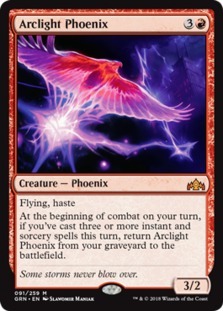 Arclight Phoenix is the hardest to return from the graveyard since we need to cast three spells in one turn, but it's also the most powerful, giving us a hasty 3/2 flier. Thankfully, we have some One with Nothing tricks to get it back from the graveyard, which we'll talk about in a minute. 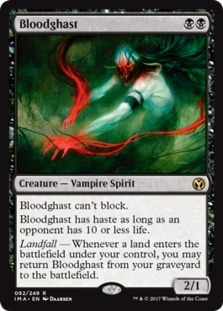 Meanwhile, Bloodghast reanimates itself whenever we make a land drop, which means we can discard our hand to One with Nothing with an uncracked fetch land on the battlefield and then return Bloodghast by cracking the fetch. Finally, Prized Amalgam is basically along for the ride. While it can't return itself from the graveyard, whenever we get back an Arclight Phoenix or Bloodghast from the graveyard to the battlefield, all copies of Prized Amalgam follow at the end of the turn, giving us some extra free bodies on the battlefield. When it comes to getting Arclight Phoenix back from the graveyard, we have two plans involving One with Nothing. The first takes advantage of the fact that One with Nothing is an instant and works sneakily well with Infernal Tutor. If you're not familiar with Infernal Tutor, it's basically a bad tutor unless we're hellbent, when it turns into a Modern-legal version of Demonic Tutor. The plan here is simple: we cast Infernal Tutor but maintain priority, so while Infernal Tutor is on the stack, we can cast One with Nothing to discard our hand, which then turns Infernal Tutor into Demonic Tutor since we're empty-handed when it resolves. In theory, we can then tutor up any card from our deck. 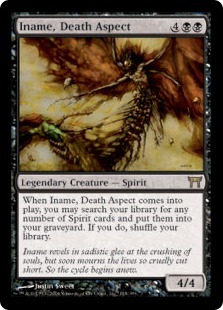 But we often want Noxious Revival, which we can cast for its Phyrexian mana cost, putting Infernal Tutor back on top of our deck for the next turn while also counting as our third spell for the turn to get back all of our Arclight Phoenixes and Prized Amalgams. When we have the right draw, we can do this all on Turn 3, potentially getting back up to 12 power of Arclight Phoenixes after discarding them to One with Nothing! 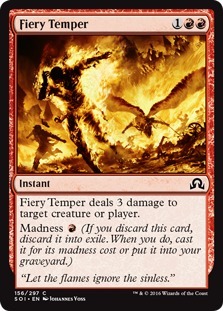 Plan B for returning our Arclight Phoenixs and Prized Amalgams on Turn 3 is using One with Nothing to discard Fiery Temper and [[Alms of the Vien], both of which we can cast for just a single mana if we discard them, thanks to their madness cost, to hit our opponent for three damage. As such, a hand with a bunch of Arclight Phoenixes, Bloodghasts, and Prized Amalgams plus One with Nothing and any two of Fiery Temper or Alms of the Vein ends up giving us a Turn 3 where we dome our opponent for six and also get back a bunch of creatures from the battlefield to finish our opponent off over the next turn or two. 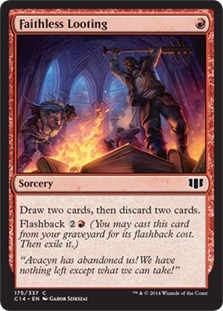 Faithless Looting and Burning Inquiry give us some backup ways to fill our graveyard in the early turns while also digging through our deck to find One with Nothing, Infernal Tutor, and our other key cards. 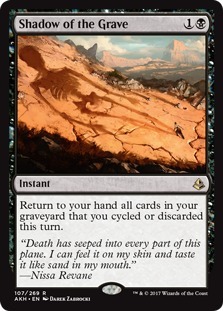 We've talked a lot about trying to kill our opponent on Turn 3 with the help of One with Nothing, and this gets even easier when we have cards like Faithless Looting and Burning Inquiry to start stocking our graveyard with recursive threats on Turns 1 and 2. Finally, Shadow of the Grave is just a one-of, but it has some unique card-advantage-generating potential in the deck, especially in the late game. 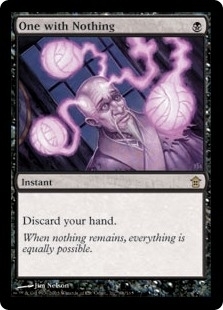 Once we have four or five lands on the battlefield, it's possible that we can cast multiple copies of Faithless Looting and Burning Inquiry in a turn and then get back all of the cards we discarded, with the help of Shadow of the Grave, making it a solid one-of tutor target for Infernal Tutor. The reason we don't have more copies is sometimes we don't actually want to get all the cards we discarded back from our graveyard to our hand since much like One with Nothing, Shadow of the Grave is an all-or-nothing affair, so we'd have to return the recursive creatures that we wanted to discard along with all of the utility and support cards that we'd like back in our hand. Still, as a one-of, Shadow of the Grave has enough situational value that it's worth a slot in our deck, especially since we can tutor it up in situations where it is good. In theory, One with Nothing can beat just about any deck in Modern if it gets a solid Turn 3 combo draw. On the other hand, it does struggle with a couple of things. First and foremost, the deck is extremely reliant on the graveyard, and the Modern format is pretty prepared for graveyard decks. 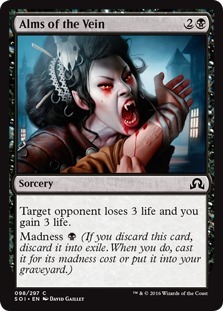 This means even when we get a nut draw, we occasionally still lose because our opponent has Ravenous Trap or Surgical Extraction to exile our graveyard. 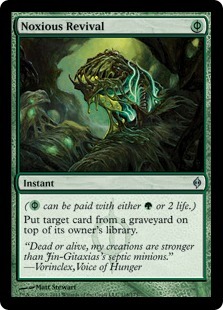 Second, we don't really have removal in our graveyard, and while our creatures are good at attacking, they aren't very good at playing defense, which means we sometimes just get run over by aggro decks that curve out starting on Turn 1, especially if we don't have our most optimal draw. All in all, we played five matches with One with Nothing and ended up winning two, good for a 40% match win percentage, putting One with Nothing solidly (although not massively) below-average for an Against the Odds deck. That said, perhaps our most spectacular games ended up as losses, such as our last match versus Grixis Control, where we had some really frightening One with Nothing combo draws but our opponent had graveyard hate at the ready to blow us out. It's hard to hold that against One with Nothing specifically since the same thing would have happened no matter how we were stocking our graveyard. So rather than being a mark against One with Nothing, it's more of a testament to Modern being extremely ready to fight graveyard decks. 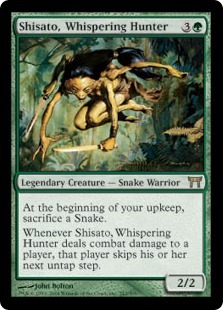 Speaking of One with Nothing, the card itself is extremely high variance. In some games, we literally can't cast it or we'll basically lose the game on the spot. In others, it enables some extremely powerful game-ending combos. The biggest problem is how all or nothing the card is. A version of One with Nothing that allowed you to discard any number of cards from your hand would probably be very playable and maybe even broken in some decks. 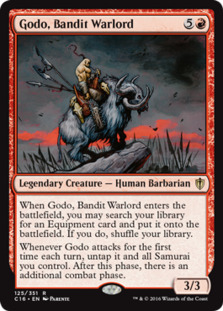 But as is, the card is either broken or uncastable while also lining up poorly with the Modern format as a whole. Still, heading into our matches, I thought we might not win a game with One with Nothing, so winning 40% and losing a couple of games that we would have won if our opponent didn't have graveyard hate is a pretty solid showing for the card in a format as powerful and hateful as Modern! Last week's poll wasn't especially fair: everyone voted for One with Nothing so none of the other sweet Kamigawa cards really had a chance. As such, today we're going to give the non-One with Nothing cards from Kamigawa a second change. Along with a couple returning options from last week poll, we also have some fun new additions. Which of these janky Kamigawa cards should we play next week? Let us know by voting below!